This blog has hit a snag that surely we all knew it would eventually, when Emily lost interest in eating baby food, and started eating what we do. Frankly, I don't think I can really do a banana true justice in a review, so I've had to turn my hand to other pastimes, like work, and spending quality time with my beloved family. We go to the circus, to which Luke asked if I would run away with him. We watch Fireman Sam (my favourite episode is the probably the one in which Station Officer Steel stays in his office all day polishing his helmet). And tonight, Emily and I live tweeted The Bachelor NZ (warning: shameless cross platform plug contains some strong language and adult themes). But now I find myself with the kids asleep, Rachel out, and some time on my hands, and what else do I have to do but some reviewing? Well... Paperwork, fitness, wash the dishes... But anyway. 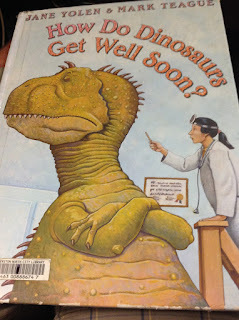 I find the premise of How Do Dinosaurs Get Well Soon, albeit well meaning without a doubt, still to be a troubling one. 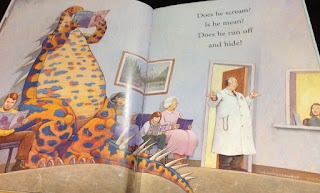 The story follows, in simple rhyme, the exploits of a group of parents whose offspring contracted probably upper respiratory tract infections, and their trips to seek medical attention for their young. But the fruits of the loins of these mothers and fathers aren't your regular snotty nosed kids, no, somehow, these mums have given birth to dinosaurs. 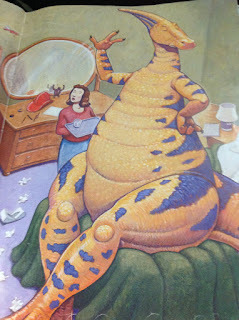 And not just any run of the mill T-Rex or stegosaurus, but some quite exotic dinosaurs at that. Here, for example, is the universal childhood favourite the Tuijiangosaurus pretending to read Vogue magazine whilst waiting to be seen, while their GP has presumably suffered a catastrophic sudden loss of vision in being unable to find them in the room. 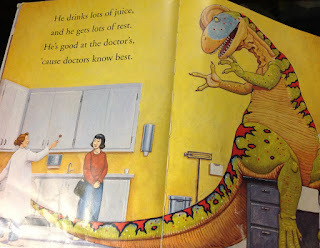 And herein lies the next problem, as on the next page, the young reader is told that a sickly dinosaur would listen to the doctor as doctors know best. Now, as a training general practioner, I feel qualified to comment on the accuracy of this statement. If a petite young mother were to bring a sneezing, fully grown dilophosaurus into my office, my first reaction would very well not be 'stand back, I know best, here's a lollipop for you, you adorable non-opposed-thumb bearing dinosaur, now you go get well.' First would likely be a sharp explanation to the point of 'JFC there's a giant carnivorous reptile in my room.' Secondly, I would probably express surprise that such an obvious humanoid young lady could be related to such a hideous prehistoric beast. And thirdly, I would unfortunately have to point out my degree is in human medicine, so no, I would not have the first clue in how to treat your offspring's cold. 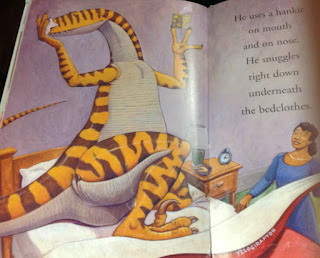 But unfortunately, there's more, as it's not just the human/dinosaur interaction trap that HDDGWS has fallen in to. Jurassic Park and its inferior sequels have unfortunately a series of serious questions to answer when it comes to their influence on dinosaur taxonomy trends. For this is not a picture of a velociraptor, it is a deinonychus. But I suppose, however much we may wish it so, scientific accuracy isn't the end goal of this book, and in the end the dinosaurs do tuck themselves up in bed, take their medicine, and in deed get well soon. So maybe I am just being harsh when I give it a 6/10 for the storyline, but 2/10 for the science.